Read here about tensegrity structures composed of twelve struts, part of a series of pages organized by strut count. The regular 12 strut tensegrity can describe a cube or cuboctahedron. Kenneth Snelson constructed a series of four tensegrity structures that metamorphose slowly from evoking a truncated octahedron to evoking a truncated cube. Each model features 12 struts in a new arrangement. 8 strut cube metamorphosis by Snelson. See You Can Touch This. 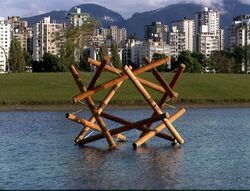 Floating logs by Flemons is composed of twelve logs. Floating Logs by Tom Flemons. For more information, see Flemons. This page was last edited on 22 September 2018, at 18:05.